We had a stressful Monday. Granddaughter (17) in hospital. Acute appendicitis. It's quite a relief that everything seems okay now. Deze was in Kalmhout arboretum. De onze , een meer rode, heeft op het moment 6 bloemen. A gorgeous bunch of tulips Bep - sorry to hear your granddaughter had to go to hospital - I hope she will soon recover ! The tulips are gorgeous And I am so sorry to hear about your granddaughter. Good to know there was a good result. Your photo is a beautiful composition. A lovely birthday bouquet . Sorry to hear about your granddaughter. I hope she recovers very quickly. 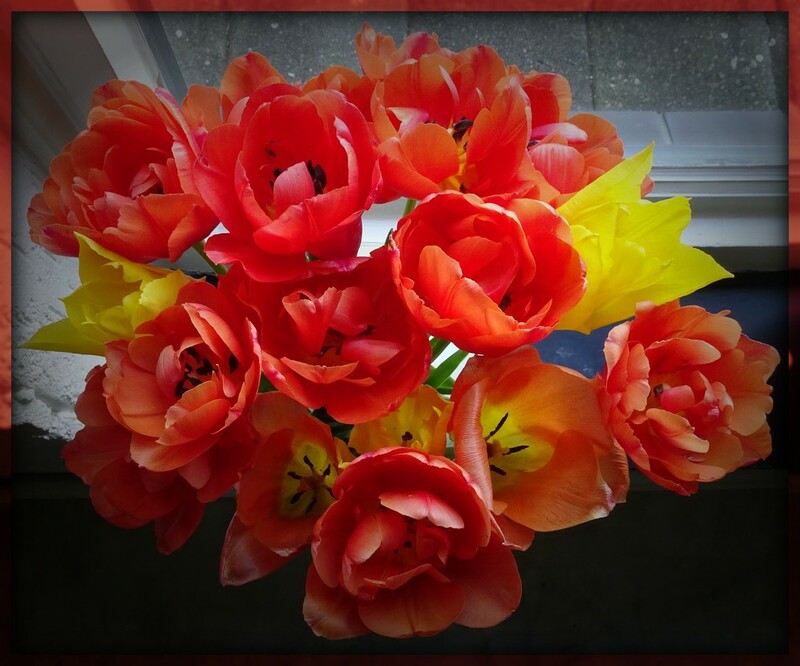 Gorgeous tulips .. All the best to your granddaughter. Such a pretty colour and I love how open they are! They’re beautiful, glad that your granddaughter is ok. Many happy for the birthday (yours?) amd good wishes for the granddaughter. Lovely photo! Oh poor girl, a worrying time for you all, hope she’s feeling better now & on road to recovery! You will all be shattered after that scare! Not what you want on your birthday! Thanks, Hazel. Yes, it was my birthday. So pretty! Glad to hear your granddaughter is doing better! So glad your granddaughter is recovering. How scary. This tulips are exceptional.